Comments: Luke Skywalker, one of the heroes of the Rebel Alliance, goes to the planet Dagobah to learn how to be a Jedi Knight. He meets the wise and mysterious Yoda, who teaches Luke how to use the Force to fight the evil Empire. Luke leaves Yoda before his training is finished, because he learns that his friends are in danger and he must go to save them. 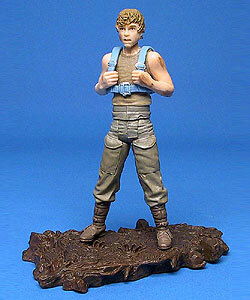 While this Luke Skywalker figure does not include any other title description, it is part of the Dagobah-themed wave and therefore is listed that way in our archives. Use backpacking head and arms, and combine with Yoda OTC #2 figure to re-create the Dagobah scenes! A variation of this figure was made with Luke packaged upside-down in a handstand position. The same accessories are included in both versions. Also included with this figure is a folding pamphlet that shows other toys in the Original Trilogy Collection.